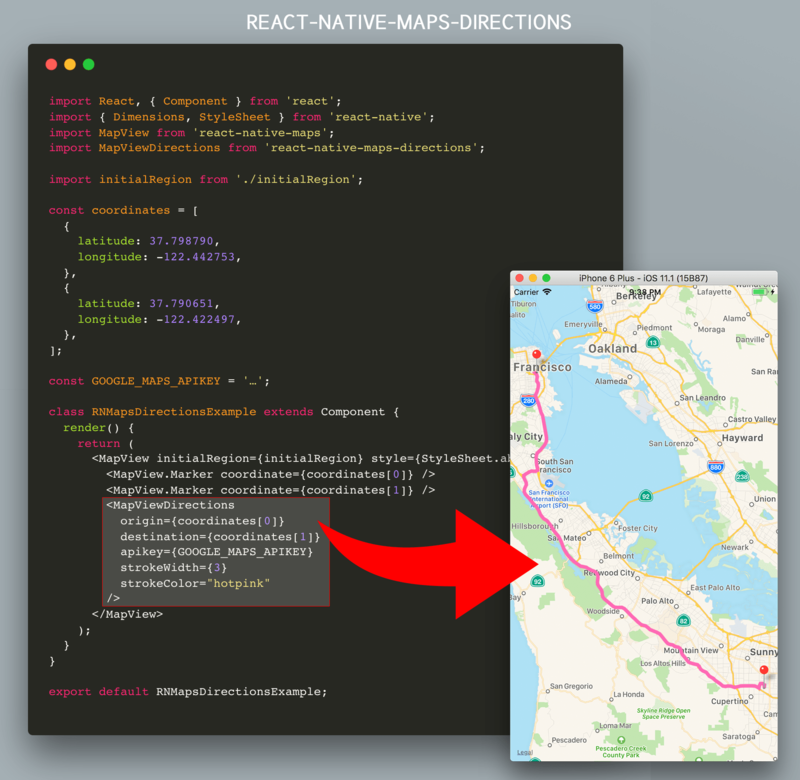 One of the things I found missing in the aforementioned react-native-maps was the ability to route between to coordinates. Combining the feedback from the related issues on GitHub (#52, #778, and #929) I’ve created a standalone component that does exactly that. Once the directions in between both coordinates has been fetched, a MapView.Polyline between the two will be drawn. Therefore all MapView.Polyline props – except for coordinates – are also accepted. Hi, can you explain to update origin and destination dynamically? Change the props and everything will be recalculated. Hello, I can show time(duration) and distance between origin and destination ? I can’t use mode transit. Help me ? It doesn’t work for me, even though my code looks exactly the same as the one illustrated. In the MapViewDirections tag it only works if I define longitude and latitude directly and not if I reference the array called coordinates. What could be the problem? How can I detect if my current location is off route? in my app react-native-maps-directions is not working i’m coping your code. but it didn’t work for me. please look out this code. Hi, great work and thanks btw. Can i use it with the MapView component from expo?